Landscaper in Clemson - Cochran Management, inc.
We will provide you with the best results possible, regardless of how big or small your project is. We encourage you to work with the most reliable landscaper in town! Best known as the home to the Clemson University campus as well as home to 13,905 people, and is located in Pickens and Anderson counties in South Carolina. Residents and visitors will enjoy the culture of the college town and its small two-block downtown located north of the campus. In addition to the university, the city is home to the South Carolina Botanical Garden. Other attrac tions include the shore of Lake Hartwell, Fort Hill Plantation, Bob Campbell Geology Museum. There are many additional attractions in nearby cities such as Anderson, or Greenville and the Blue Ridge Mountains, which is just 30 miles from the city center. 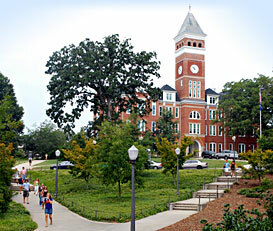 Clemson is also known for their message of providing a strong sense of community and great quality among residents. The median income for a household in the city is $26,892. A father had just replaced his child’s playground setup (now that they are grown up) with a handsome outdoor deck, but quickly realized that the space adjacent to it was missing something. He decided to call Cochran Landscape to install a quality Clemson paver patio. The Cochran Landscape designers met with the homeowner to see exactly what the space looked like and what type of patio pavers he had in mind for the space, then discuss what Cochran Landscape could provide for him and his outdoor space. The homeowner showed us the outdoor space, then our professional designers showed the homeowner our variety of paver options. The homeowner selected his pavers, then we measured the space and gave the homeowner an estimate for the entire project and the homeowner was delighted with the price and asked us to begin as soon as we could. We scheduled the installation for Wednesday. The Cochran Landscape crew arrived promptly on time and started getting the ground ready for the pavers. The crew made sure that the ground was level, then started placing the pavers and by the end of the afternoon the project was completed for the homeowner. The homeowner is now enjoying grilling, eating, and drinking beers with friends outdoors because Cochran Landscape provided him with the best paver patio Clemson homeowners could appreciate. The homeowner’s kids are even enjoying the paver patio, because now they can sit outdoors and have a nice surface that is dry and smooth.